Like all great wide-screen musicals, rent this one in pan & scan, and you'll be missing parts of the dance numbers. But even if you can't get it wide-screen, don't miss it! This is a wildly entertaining homage to the hayday of musicals. For a long time I've had a theory that the musical genre couldn't survive the cynicism of modern audiences except as a ironic in-joke, like the "South Park" movie or as a post-modern homage, like Woody Allen's "Everyone Says I Love You." I couldn't have been more wrong -- and leave it to Kenneth Branagh, a writer-director-actor who has made his name revitalizing old (old, old!) school entertainment -- to prove it by bringing back the kind of weightless musical delight that carried Fred Astaire and Ginger Rogers to stardom. For his new adaptation of Shakespeare's "Love's Labour's Lost," Branagh has re-imagined the buoyant romantic comedy as a classy, corny, 1930s movie musical, complete with uplifting dance numbers and a catalog of favorite big band ditties sung with great enthusiasm (if not great skill) by a quality cast of cheerful actors clearly having the time of their lives. The plot revolves around the capricious young king of Navaree (Alessandro Nivola, "Mansfield Park") and three of his happy-go-lucky lords (Branagh, Matthew Lillard and Adrian Lester) who take an oath to cloister themselves from all feminine distraction for three years of pure academic betterment. Of course, unbeknownst to them a beautiful, effervescent princess of France (Alicia Silverstone) and her three lovely ladies in waiting (Natascha McElhone, Carmen Ejogo and Emily Mortimer) are about to arrive on a diplomatic business and wreak love-at-first-sight havoc on the gentlemen's pact. Branagh has dropped the story into pre-World War II Europe, cleverly setting the stage with mock royal-watching newsreel footage that substitutes for The Bard's dialogue at times in order to more quickly advance the plot -- what there is of it. The development of the love stories are often left to be presumed from musical numbers because of time constraints. But such is the nature of the genre, and this sacrifice of character depth is worth it, really. 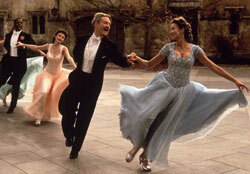 Branagh and his boys get off to a bumpy start with a couple numbers that are all-too-obviously pre-recorded and accompanied by pretty clumsy dancing, but once "LLL" finds its melodic groove, it's nothing less than irresistibly enthusiastic merriment. Unabashedly old-fashioned in his methods, Branagh encourages stylized acting and singing (Nivola punches a finger in the air for emphasis while belting out a tune) and pauses for wonderfully silly set pieces featuring Timothy Spall ("Topsy-Turvy") hamming it up as Don Armando, a lisping royal hanger-on, and Nathan Lane as Costard, the king's Vaudevillian jester. While Nivola, Branagh and McElhone ("Ronin") are stand-outs for managing to portray strong romantic emotions amidst all the twinkle-toeing, the other primary players are an uneven bunch. Many of them are given too little screen time to define their characters (the women do little more than titter and giggle). Some are questionably cast in the first place, like teen-freak character actor Lillard ("SLC Punk!") and Silverstone, who, suffice to say, gets by largely on her near-supernatural cuteness. Regardless, "LLL" is just a joy to watch and Shakespeare's text lends itself well to the song-and-dance setting. This isn't thinking people's Shakespeare, after all. It's purely a crowd-pleaser, and Branagh has no delusions about making it anything more -- which is precisely why he chose in the first place to turn it into a light-hearted musical featuring upbeat tunes like Cole Porter's "I Get a Kick Out Of You" and Irving Berlin's "Cheek to Cheek." He gives the film a distinctively period look too, lifting MGM's musical photography style, shooting outdoor scenes on soundstages, dressing the men in handsome tails and bow ties, and the women in sumptuous, Technicolor gowns. The movie is irrefutably imperfect. It barely pays lip service to a third-act switcheroo cooked up by the princess and occasionally it suffers from all the missing chunks of story left on the editing room floor. Sometimes it's even a bit confusing: One masked dance number comes across like a fantasy sequence and it's two scenes later before you'll realize it was supposed to be real. But the fact remains that no one has made a musical like this in more than 50 years, and Branagh pulls it off beautifully. That it's a Shakespeare play to boot just feels like a bonus.